Is there any Love for Insomniac’s Fuse? I have following this game for a while since Insomniac Games are one of my favorite developers. I enjoyed their Ratchet and Clank series and love The Resistance Trilogy which I usually play split screen with friends. 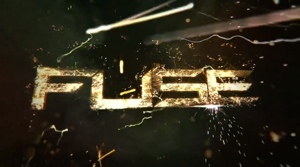 Since Fuse has been announced (as Overstrike) it has taken a barrage of criticism from every angle. The demo was released yesterday (May 7) and seems to be a nice introduction to the game and it’s 4 playable characters. 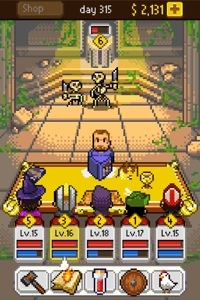 The game also looks great and with the ability to freely switch between each character and their unique fused weapon offers up some strategy. The game offer some platforming stretches to go along with its cover based combat. You have different options on how you want to upgrade each character as well as the ability to play with friends online or split screen. I have had this game pre ordered for a few months now and the demo reinforced my belief in the game. Hopefully the demo will spark some positive conversations about this strong new IP. I have been keeping my eye on this game for a few weeks and finally picked it up about a week ago. The game lets you select up to 5 characters and classes then puts you in the hands of a Game Master that guides you through your adventure. You get a choice of 5 classes (Paladin, Wizard, Cleric, Druid, and Rogue) to choose from to start them unlock more as you go. Also you earn in game money by adventuring and can spend it upgrading your weapons and armor or buy items for your table to boost stats. My first group started with a Paladin, Rogue and Wizard. The trio worked well but when I unlocked the Bard class I restarted. My new group was Paladin (tank), Wizard (DPS), and Bard (healing). Using this group I saved money and quested to unlock the rest of the classes (necromancer, hunter, barbarian, and knight). Along the way I added a Knight and Hunter to my party to see how the classes work. After unlocking the development team (5 new characters to chose from) I restarted again using those characters. My team now consists of a Necromancer, Paladin, Hunter, Cleric and Wizard. I found this combination to give me amazing balance with a tank, 3 DPS with AOE ability and a healer. 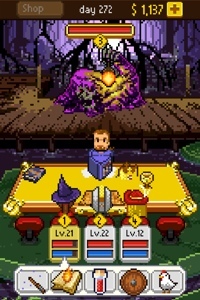 The game has a unique sense of humor having quests like Bhostguster with the quest giver maned Mill Burray. The game gives you lots of choices on how you can build your team and how you play each class. It has a simple base game that hooks you, but has a lot of good strategy hidden underneath the surface. I am addicted, it’s on of the best games I have played this year. Best of all it’s a game you play off line so I can play it at work! I am having a craving to play something different and outside the box. I use to love playing JRPG’s and since my main overseas franchise, Final Fantasy, is slowly westernizing I set out looking for a new experience. After doing a lot of research and realizing there are a few companies brining over some niche JRPG I narrowed down my choices. I was thinking either the Record of Agarest War series, the Hyperdimension Neptunia series or wait until a new title is released. 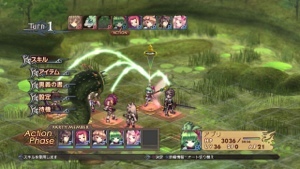 I am leaning towards Record of Agarest War due the fact its a tactical RPG with a simplified battle grid like the Final Fantasy Tactics series. After reading reviews for both series Agarest seem have more of what I was looking for. The final thing leaning in Agarest’s favor is ease of purchase and price, it’s on PSN for 20$. If anyone has any other suggestions please leave me a comment and I will check them out before I make a purchase. Reality hit home on how bad my hunting of 5*’s has become. When I got my team set up for this weeks coliseum using the auto select it did not include my first ever hunted 5*. It turns out that my Intelligent Ifrit had been beaten out by my Ace rebirthed Golem and Caim. To put icing on the cake my only other naturally hunted 5* didn’t make it either (Power Phoenix). I am glad that I have some good friends in game that have traded me some good 5* guardians when they got doubles and the few trades I made some time ago! With this revelation I decided to send out some trade requests and try and find a better typed Ifrit to rebirth my own into a useful member of my team again. After searching the boards and sending out a few friend invited to people with Ifrit’s that I challenged in coliseums. After a day or two of hard work I found a nice gamer who was interested in my Power Phoenix straight up for his Power Ifrit. I hope to rebirth him sometime this week and have him ready for next weeks coliseum. 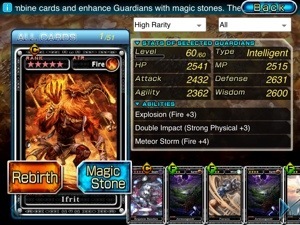 With the rebirthed Ifrit has a great +25% Atk bouns when it hits level 70 which brings it out of oblivion to be a solid member of most decks. I am glad my good friend can come back to relevance, he has been a good trooper of mine for a very long time. 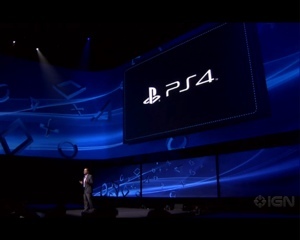 Well after a lot of speculation the big February 20 announcement was made and it’s the PS4!! Time to save my pennies! 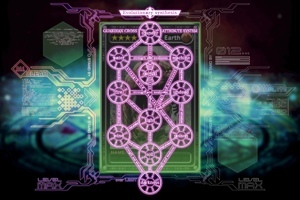 Starting this morning the Rebirth system went live in the international version of Guardian Cross. Even though this will make the elite players with multiple accounts even more top end elite I am looking forward to seeing how my deck will change. I am almost afraid to see how dominate some of the top end decks will become especially with newer 5*’s like Thor or Hornfrost Phoenix rebirthed. I know for sure now that I will never be able to compete at the top end due to my lack of skills acquiring 5*’s but I am looking forward to seeing how my 4* Aces will evolve and affect my team. 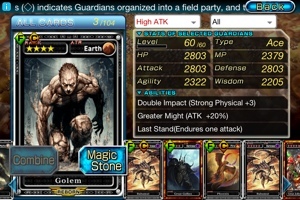 I just Rebirth my Ace Golem and leveled him to his new cap of 60, the addition of the “Last Stand” skill will help him compete with the newer 4* guardians that were released in the desert and snow zones. I still have my Ace Angel, Caim and Talos to rebirth and hopefully make a run at some new cards in the coliseums. I am also now on the search for some off standard 5*’s like a Brave Bahamut or a Intelligent Ifrit. I have limited trading resources so I will have to be patient, but that is never a problem for me. 4 more Special Hunting Tickets, No 5*’s! Well I decided to bite the bullet this last week in Guardian Cross and tank the coliseum and finish with a C+ to get a special hunting ticket (SHT). That combined with completing my 15 log sheet would give me two SHT’s to use Monday. During the week with the announcement of the new guardians I though I have enjoyed the game enough that I could put a few more dollars in Square-Enix’s coffers and I picked up an iTunes with the plans of buying 2 more SHT’s. Monday come and I purchase my coins and empty enough space in my deck for the upcoming hunt. I did my free daily ticket then jump into the 4 SHT’s with high hopes. My targets were maidens, birds, giants and floaters. That’s right, another series of hunts and unfortunately my luck has not changed (the 4*’s were 2 chaotic and 1 brave). In all my hunts there was only one maiden or giant to be seen so I ended up killing a lot of birds and floaters. It’s becoming a bit discouraging every time I do a special hunt and end with nothing I can use. I have only 2 5* kills in my long career playing GC (35+ SHT), but I understand the reason for the low percentage chances of getting 5*’s. My problem is that I need some new blood for my team to stay relevant even in the masters coliseum. I have hopes of getting a Valentine Specter this week but am not confident it’s possible. I am not sure how many more Special Hunting Tickets I will buy, I have already dropped around 20$ on Guardian Cross with zero success. I am still enjoying playing because of the friends I have made but unless I get another 1 or 2 5*’s soon I can see my interest slowly fade away. Here is hoping my next big giant in the volcanic zone is Gilgamesh!